Wow, an insanely busy week and just about every muscle we have has been sore at one time or another, a lot of ibuprofen going down! Tomato Week, started last Friday with covering the four Big Tops that keep our plants happy and dry. Monday, we did the final tillage on the beds and laid the irrigation lines and landscape fabric. Wednesday and Thursday Jennie and Liz built the 1600 feet of trellis for the plants to climb up. Right now they are out planting the 23 varieties on a perfect overcast day for transplanting, hopefully it will just shower and not thundershower this afternoon. Last Thursday I spent the day down at the Center for Environmental Farming Systems (CEFS) for a Board meeting and tour. Now in its 20th year, it is the largest organic and sustainable research farm in the US. 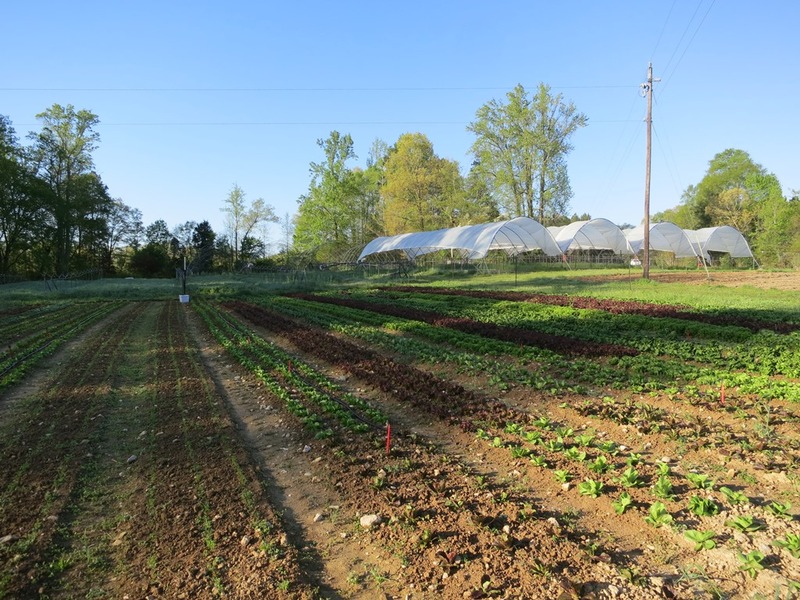 More than just a farm, they also do work all across North Carolina in both farming practices but also food systems, food access and other parts of a healthy farming and marketing system. We have been involved from its inception and continue to serve on the advisory board. On top of all that I taught three classes this week, whew! One thing we are not participating in this week is the Farm Tour, third year in a row after 16 straight years. Next year is the 20th anniversary and we will probably jump back on to commemorate the founding and steering of it all those years. It is a great way to see so many of our local small farms and where your food comes from but with so much going on here, it is just too hard to do both. Our lettuce with be back in Weaver Street Market Carrboro and Southern Village stores beginning this week. The lettuce is perfect right now, we have Green Boston, Romaine, Red Leaf, Little Gem, Red and Green Oakleaf and some Salad Mix. Red Beets and Easter Egg Radishes in the roots. A bit of Spinach and Baby Swiss Chard for greens. Cilantro. More of the ethereal Poppies! Still plenty of Anemones that look like brilliant crepe paper and rose like Ranunculus. Beautiful large Viburnums.